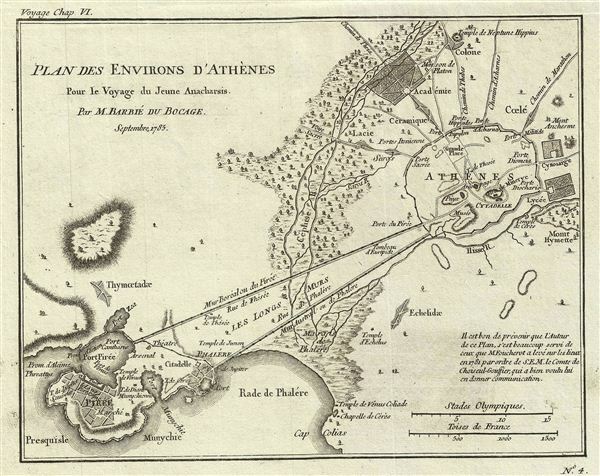 Plan des Environs d'Athenes Pour le Voyage du Jeune Anacharsis. This lovely little map or city plan of Athens and environs in Ancient Greece was prepared by M. Barbie de Bocage, after D'Anville, for the 1785 Travels of Anacharsis. Athens, capital of the Athenian empire, was the heart of Ancient Greek culture and the quintessential Ancient Greek city state. It was here that Greek philosophy and literature as well as the concept of democracy first evolved. This plan of Athens, based on excavations and ancient sources offers impressive and accurate detail. This map additionally includes the Long Walls, build to protect merchants as they passed from Athens to the port city of Piraeus and the famous Academy of Plato.